Having suffered from Repetitive Strain Injury (RSI), I know how debilitating it can be. Pain can be excruciating at times and symptoms include shooting pains down the forearms into the wrists and hands. Here are some simple tips to help prevent the onset of RSI. 1. Until recently I have always used keyboards that have a height adjustment at the rear of the keyboard, believing that the back of the keyboard should be raised when typing. This is not true and this is the mistake I made. The keyboard should be flat and below elbow level. This position makes it easiest to type with your wrists in the neutral position. Do not bend your wrists out, keep them straight at all times. 2. Adjust your display so that the monitor is directly in front of you, with the top of the screen at eye level. You may have to play around with this a bit if you wear varifocals. 3. Many people develop RSI in their mouse hand. A gel wrist pad may help you to keep your wrist in a better position while using the mouse. You should try to keep your wrist in a neutral position and keep the mouse within easy reach. 4. Don’t slouch, sit up straight! Spending many hours in front of a keyboard can play havoc on your neck muscles. Bad posture is a primary risk factor in RSI. 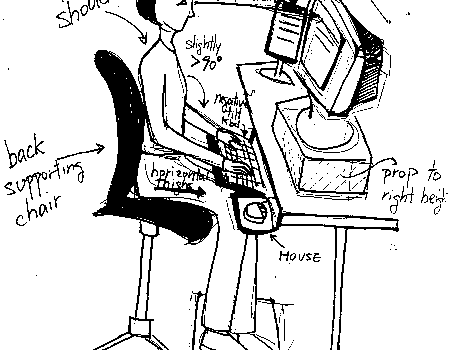 Adjust your seat so that you sit up straight, rather than leaning forward over the keyboard. 5.Invest in a good quality chair as this is where you will be spending most of your day and the last thing you want is a frozen bum! When sitting on the seat pan, your lower back and bottom should be firmly at the back of the seat. 6. When seated, the lower part of your back should be well supported and in contact with the chair back. Your neck and shoulders should be relaxed, avoid leaning forwards as well as raising or lowering your shoulders disproportionately. 7. Take a break. For the prevention of RSI, you should take a five-minute break after every 20 or 30 minutes of continuous typing. Walk around and stretch your muscles as they will have become very tight after sitting in one position for too long. 8. Finally, if you are already suffering with RTS, what I found helpful was investing in some arthritic gloves (these are fingerless), a wrist & forearm support and a body posture brace. You can buy all of these at most chemists or online. Some brands can be a bit pricy, but I think as it’s your health we are talking about here, you can’t really put a price on that.